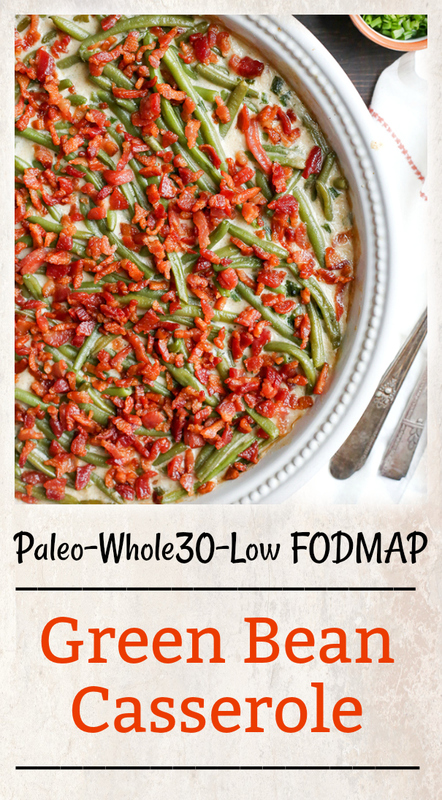 This Paleo Low FODMAP Green Bean Casserole is easy to make, full of flavor, and a healthy side dish. 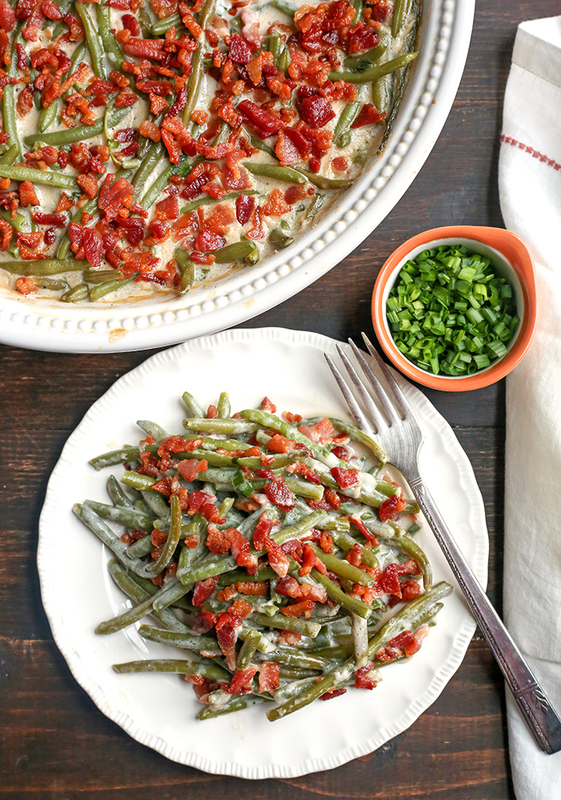 The green beans are covered in a creamy sauce and topped with bacon. Gluten free, dairy free, and Whole30. This is very last minute, but I really wanted to get it up in case you’re looking for a low FODMAP dish for Thanksgiving. I already have a Paleo Whole30 Green Bean Casserole on my site, but it uses a cream of mushroom which isn’t low FODMAP. This is similar to that recipe, but the cream sauce is mushroom and onion free. It uses garlic oil, green onion, and fresh herbs for flavor. The cream sauce is so simple to make. A mixture of ghee and cassava flour make the roux and some broth and almond milk are added in for creaminess. I used frozen green beans (2-10oz bags), but you could even use canned green beans if you prefer them softer. They do have a little crunch to them still, which isn’t bad, it’s just about personal preference. I still went with the crispy bacon topping because it’s delicious and pretty easy. 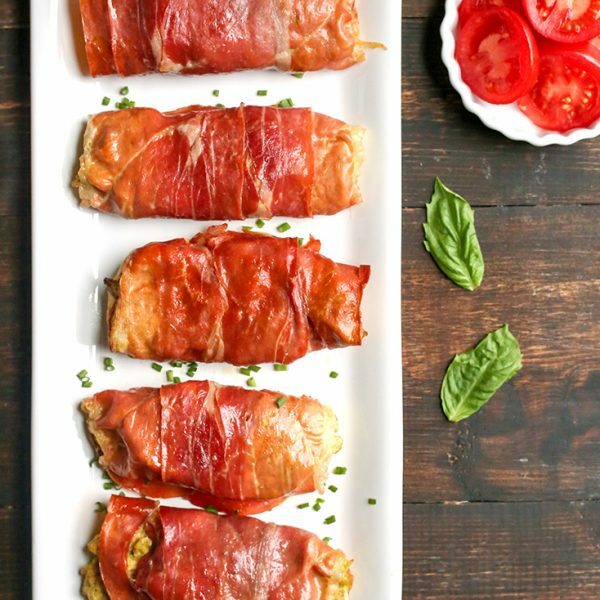 While the casserole bakes, chop up some bacon and cook it in a pan until it’s almost crispy. Drain the grease then add it to the top of the green beans and bake a little longer. 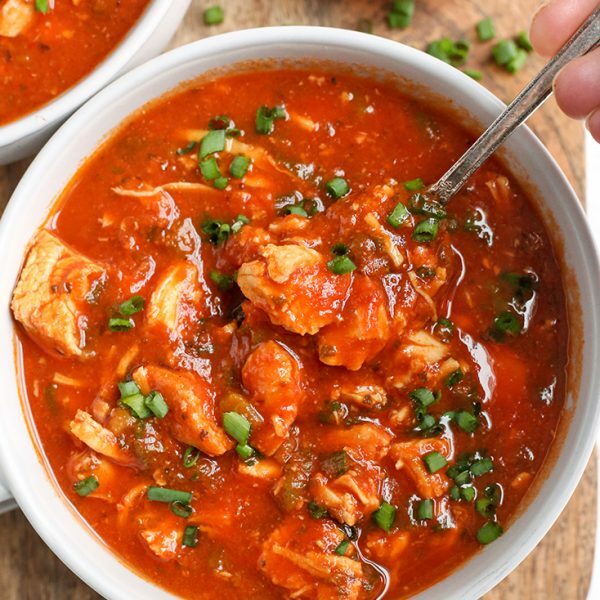 So easy and it adds great crunch and flavor. 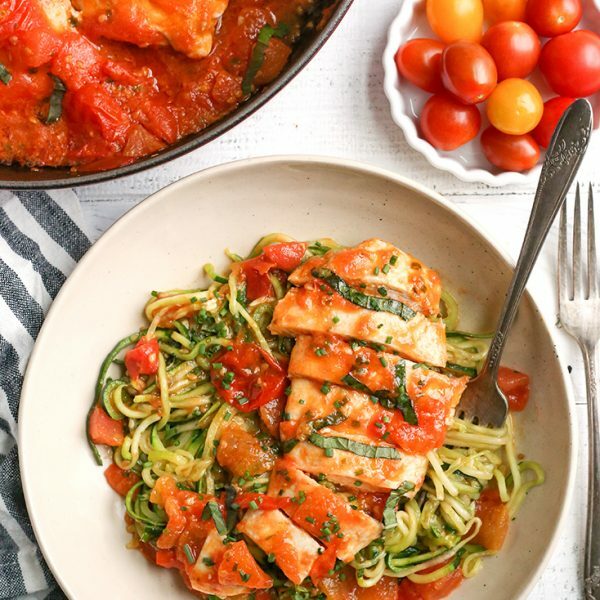 This is a dish everyone will love. 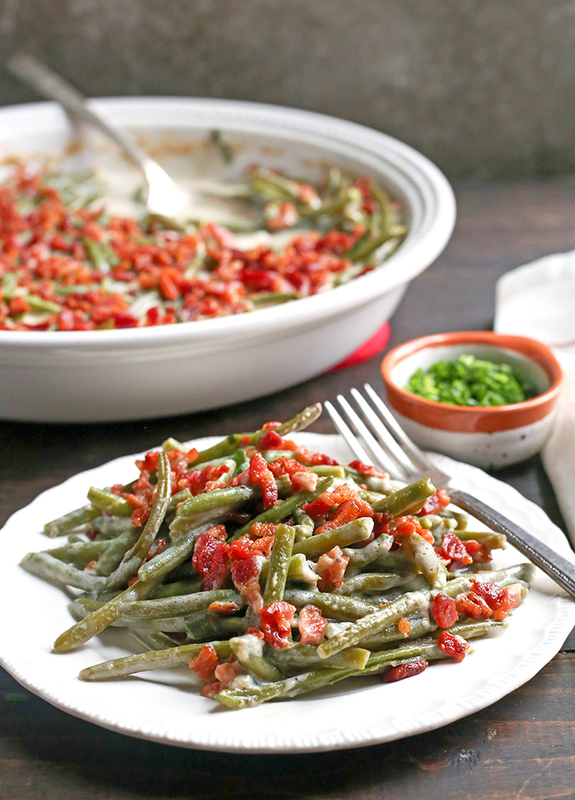 Creamy green beans and bacon is a definite crowd pleaser. 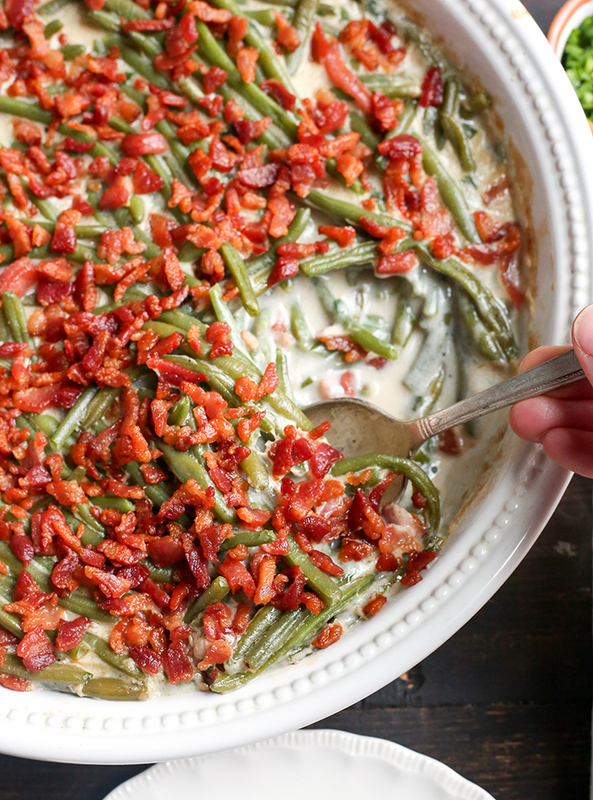 This green bean casserole is the perfect Thanksgiving side dish, but is also good all year long. A fun, tasty way to eat veggies. CLICK HERE for all my Thanksgiving recipes including a turkey, mashed potatoes and sweet potato casserole. Preheat oven to 350° and grease a 2 quart dish. Set aside. In a large saucepan combine ghee and cassava flour. Cook over medium heat until combined. Add in broth and almond milk and whisk until smooth. Cook until thick, 5-7 minutes. Turn the heat off and add in the salt, thyme, green onion, and pepper. While the sauce is cooking, run the green beans under warm water in a fine mesh strainer and pat dry. Place them in a large bowl. 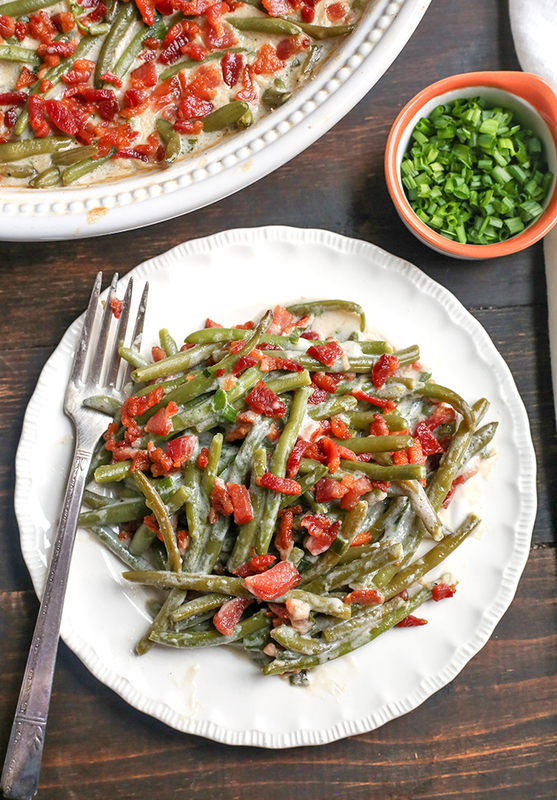 Pour the creamy sauce over the green beans and stir well. 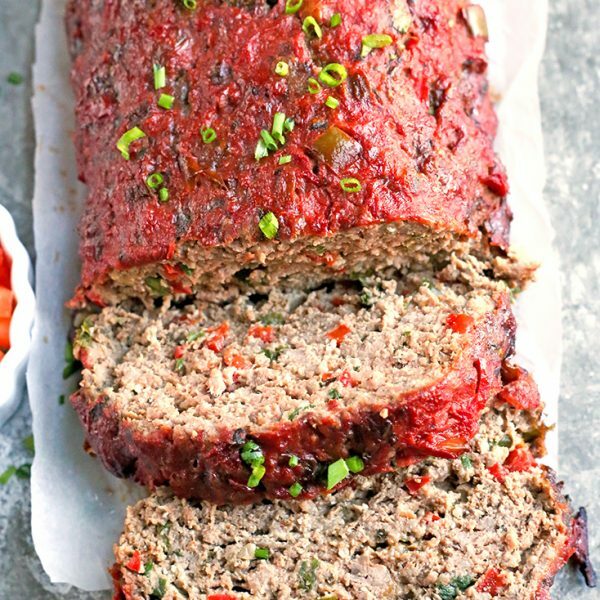 Pour into prepared dish and bake for 25 minutes. 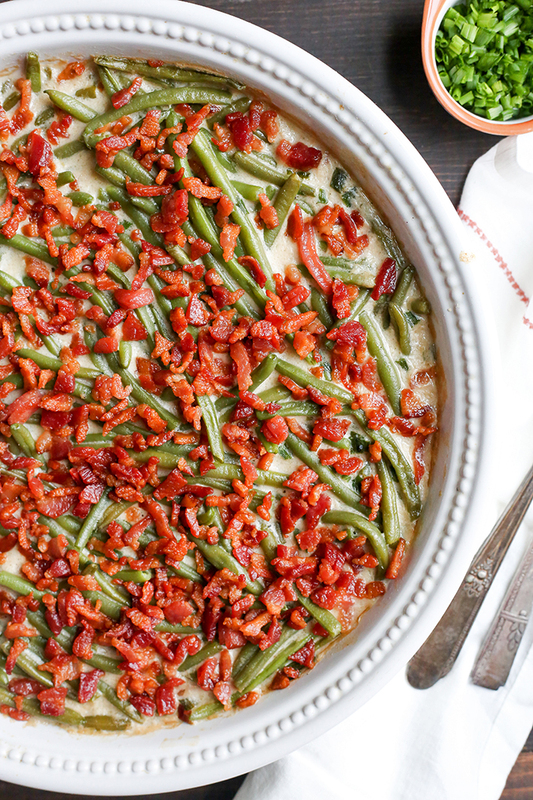 While the green beans are baking, make the bacon topping. Cut the bacon into small pieces and cook in a large skillet over medium heat until almost crispy. Remove from the pan and leave the excess grease behind. Once the 25 minutes is up, remove them from the oven and top with the bacon. Bake for 10 more minutes.